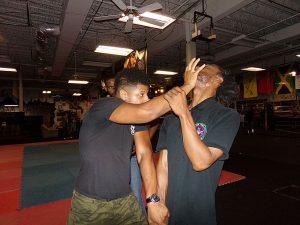 Guided Chaos Combatives is the beginner program and first level of Guided Chaos. You’ll learn the basic movements of Guided Chaos in a fun and challenging environment. Each one-hour and thirty minute lesson deals with life-threatening assaults that happen in the real-world. In addition you can begin the program anytime without any prior martial arts experience. Although the full art of Guided Chaos takes years to master devoting 6 weeks to GCC teaches you the essentials TO FIGHT FOR YOUR LIFE. As a result it’s used by members of the FBI and U.S Marines. This program is dedicated to the mastery of WWII era strikes and strategies that are proven to work! All classes are taught in a controlled environment with full attention to each student. The program is divided so that the student is able to learn at a pace that is convenient. Furthermore phase 1 focuses on teaching awareness strategies and avoiding violent confrontations. Finally emphasis is placed on dynamic preemptive striking and defending attacks from the rear. Phase 2 merges your skills with the forensic reality of violent assaults. Students are placed in dynamic scenario drills which cover most types of assaults. Once you demonstrate compentency in the basic skills of the program your eligible to receive your Guided Chaos Combatives Certification! Furthermore all certifications are given from Grandmaster Perkins or senior master instructors Lt. Col. Al Ridenhour and Matt Kovsky.